Sean Fox, a cities expert at the LSE has a great new post up at the Africa@LSE Blog discussing how incorrect analysis has been leading to poor policy for years. The popular mental model is that there is massive rural-urban migration in search of jobs. "Since the mid-1970s, African governments have increasingly adopted policies designed to inhibit or discourage people from moving into urban areas. Today, approximately 80% of African countries have policies in place to prevent rural-urban migration. At the same time, international development organisations increasingly withdrew support for urban development initiatives in favour of rural development projects, often justified by the argument (among others) that improving standards of living in rural areas will help to mitigate the growth of urban poverty." The trouble is, most urban population growth is actually just natural growth. And the rural-urban migration that does exist is driven by a range of factors, not just jobs, such as a "desire to escape age or gender discrimination in their communities, to find a wife or husband, to seek adventure in the “bright lights” of the big city, or to escape rural serfdom." Which is actually pretty clear when you just look at the data. 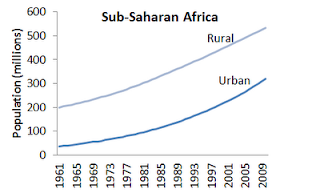 This is rural and urban population growth in Africa since the 1960s, based on the World Development Indicators (chart stolen from Ian MacAuslan). Cities are growing fast, but so are rural populations. 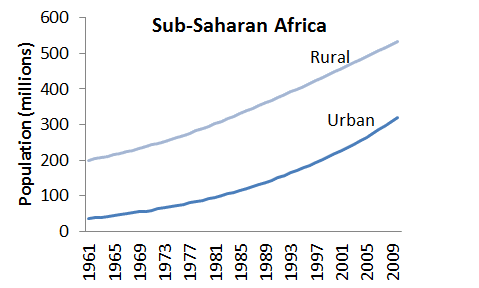 "Simply put, the rapid growth of Africa’s urban population is being driven primarily by rapid population growth in urban areas, not rural-urban migration ... For those interested in easing demographic pressure in urban areas, the only humane policy option is to try to reduce population growth by promoting fertility decline through voluntary family planning initiatives. And for those interested in promoting economic development in the region, investment in urban areas should be top of the policy agenda." Uh, I've just glanced at both the post and the paper, and I'm unconvinced. Why? Not really any data on either migration rates or even on urban/rural fertility rates is presented, which you would sort of need to make this argument. That graph doesn't reject the urban rural hypothesis at all - you could have high levels of fertility in rural areas, with large numbers of people leaving for urban areas, but not enough to prevent growth in rural areas. Finally - if migration wasn't a large factor in the growth of urban areas, we'd see a lot less ethnic heterogeneity than we do. Dar es Salaam's ethnolinguistic fractionalisation index is .9, where in some rural areas it can be as low as 0. This *cannot* happen without lots of migration, unless you're lucky enough to get that mix of people from the birth of the city. I don't agree that there's a data deficit issue here - surely you could draw on nearly two decades worth of DHS data to compare fertility rates between urban and rural areas. While you're never going to `plug the hole' in a regression here, you could at get an idea to what the non-migratory population growth differential is. It wouldn't get you as far as you'd like (especially since DHS coverage is spotty) but it would bolster you argument if you could show that the birth and mortality differentials make sense. Good point about putting too much weight on capital cities - although estimates I've seen of Dar es Salaam's growth rate seem to on par with the the average. This is why I find graphs like the one in Lee's post problematic - we're ignoring a vast amount of heterogeneity here, both across and within-countries. Thanks for the links - I'd already read Bryceson's paper. Why you are technically correct in pointing out that DSM had no indigenous population, not only were its initial migrants predominantly from the region and largely Zaramo or Swahili-speaking tribes, but many of the surrounding (again, Zaramo) villages were eventually swallowed up by the city's progressive expansion. Yes, very early on you see high levels of ethnic heterogeneity, but nothing compared to today's rates - the last census estimates of DSM in '67 put the Zaramo at nearly 30% of the urban population, where in our (admittedly non-representative) data from DSM shows that the Zaramo population has really shrunk, mainly to the benefit of outside tribes (although this could be also driven by fertility, which is why this is a really difficult argument to have without data). But again, maybe I'm putting too much weight on capitals - DSM's high degree of fractionalisation is not so extraordinary compared to other capitals, but if most urban growth is, as you say, happening in smaller towns and cities, perhaps I've been barking up the wrong tree. Hi Matt, the problem with DHS data (apart from being patchy) is that they provide fertility estimates but not mortality estimates. To accurately calculate sectoral (i.e. rural vs. urban) population growth rates (and by extrapolation, migration rates) you need both. I've tried to produce some estimates using infant/under-5 mortality and fertility, but this requires problematic assumptions about the relationship between these indicators and overall mortality. The reason that I am technically correct about the early diversity of Dar is that there was no urban settlement there before 1886. Then it grew pretty rapidly through migration from the surrounding hinterland and then from further afield (particularly in the run up to independence and the decade following). On the demographic history of Dar, I recommend reading Iliffe (A Modern History of Tanganyika) and Brennan, Burton and Lawi (Dar es Salaam...). It's important to remember that 'Zaramo' and 'Swahili speaking tribes' are a very diverse bunch in themselves - especially when one takes into account census methodology. Again, it's very important to distinguish between the history of individual settlements and overall demographic trends. Too often we look at our immediate surroundings and draw locally accurate inferences that do not hold at larger units of analysis. This is, I think, an important contributor to the persistent misinterpretation of the nature of Africa's urban transition. Why has poverty fallen in Rwanda?